The female Bullfinch is much duller than the male bird, however her heavy build, black cap and wings and white rump make her a distinctive bird. 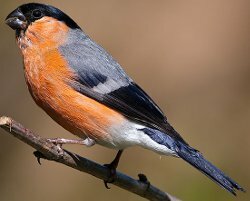 The male Bullfinch is a large heavy looking bird with distinctive red breast, grey back, black wings and white rump. 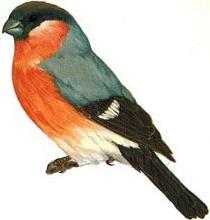 The Bullfinch is a resident breeder in most of Europe and the UK. 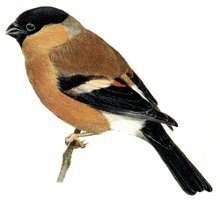 Once considered a pest in orchards due to it's diet of apple tree buds, the Bullfinch was persecuted until very rare in the UK. 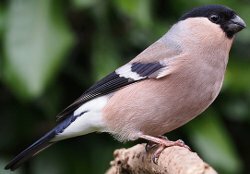 Numbers have recovered and the Bullfinch is now considered relatively common, although it can still a problem to gardeners. Despite their large bold appearance the Bullfinch can be surprisingly difficult to see and the bird is usually best seen at bird tables and feeders. With his bright plumage the Male Bullfinch is unlikely to be mistaken for any other bird. Also note his large heavy bill and powerful build. This image illustrates the 'washed out' appearance of the female, however her black parts are just as bright as the male and her wing bars can appear brighter and less grey than the males.